Sometimes, I lovingly refer to my husband as “Farmer Jones.” He comes from a family of farmers and gardeners, so it’s no surprise that he has dirt in his blood. Although we live in the city, Robby started a small raised garden in our yard last year. He loves everything about farming and gardening, from tilling the land to harvesting. So far, we’ve enjoyed our own green beans, kale, broccoli, cabbage, and carrots; and they were all delicious! I told him if he’ll grow it, I’ll cook it. A week ago, Robby mentioned a tall weed that he had allowed to grow in the middle of the garden bed. 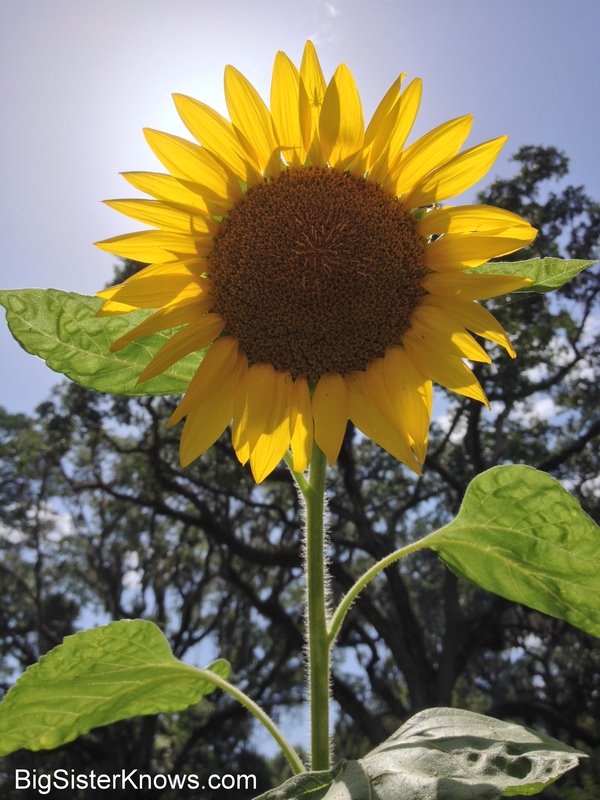 A few days later, Farmer Jones announced that his weed had bloomed – into a sunflower! 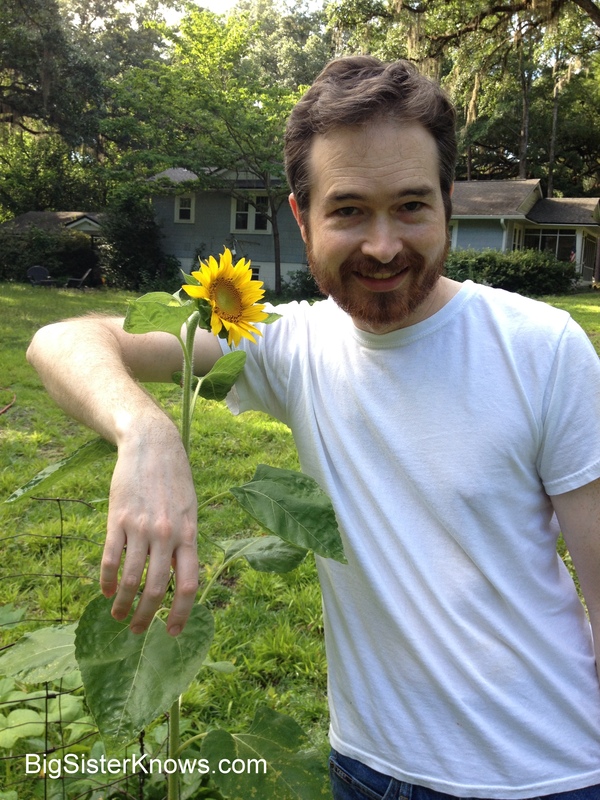 I walked out there with him and, sure enough, the sunflower was about 5 feet tall! He was so proud – and I was amazed! It’s one thing to grow what you planted, but it’s another thing entirely to grow something you didn’t plant! I knew that Farmer Jones tends his garden daily, and he couldn’t have known it was a sunflower at first. So, I asked him why he hadn’t weeded it. “I thought I’d leave it alone until I knew what it was,” he said. I’ve loved Mrs. Jones since the first time I met her, but she went up another notch in my book when Robby said that. Mrs. Jones is a wonderful woman who has worked hard for her family for many years, both inside and outside of the home. She learned gardening from her parents, and her mother is still passionate about her garden (at 94!). They all passed on their knowledge to Robby. But more than that, they instilled in him a love for it, and an appreciation that it is really God who produces the harvest (see 1 Corinthians 3:6). Mrs. Jones’ garden won’t be found on Pinterest, though. It’s not laid out in a perfect design, tortuously weeded and pruned. No, her garden has a comfortable, welcoming feel to it. If a wayward flower or vegetable is found – which they refer to lovingly as a “volunteer” – it is kept and given room to grow. Family and friends rejoice in even the smallest of harvests (“I put up 10 quarts of beans this year!”). But it’s those “volunteer” flowers and vegetables that are most precious, as if they are little gifts planted by God (“But let me tell about our volunteer squash! It just popped up!”). I realized that Robby’s garden is the same. Yes, it had started with a square raised bed, but now the squash vines are pouring over the ground, and the beans have jumped their boundaries. It’s lovingly kept, but it’s allowed to grow as God wills, surprises and all. 3. Paratroopers – Seeds that fall from above or float on the breeze, like our sunflower that was probably dropped by a bird that had lunched on our bird feeder. In our lives, we often get comfortable with God and begin to assume that we know more than we do…like what God wants to do, what He is doing, what His plan is for us. We build a pretty box around our lives and try to put Him in it. Then, when something unexpected comes along, something that doesn’t seem to belong, we pluck it out, cut it down, or poison it to death. We never realize the joy of the unexpected thing God wanted to show us or do through us. It’s true that, as Christians, we need to be careful to guard our hearts and minds, for not every weed is a good one. However, we should never guard ourselves against God. Are there weeds of opportunity in our life? Are there hidden talents in you that need tending? Have others sowed into your community, leaving you to reap the harvest and see the reward? (See John 4:38.) Are new opportunities dropping in your lap that you need to take seriously? Are there people around you who need your care? Seek the Lord, and ask Him if you’ve disregarded one of His treasures as a “weed.” If so, seek forgiveness and broaden your view of who God is and how He wants to move in your life. Just as the gardener must wait to see what the weed really is—and may even have to learn how to care for the strange flower or vegetable—seek the Lord and wait for His Spirit to give you knowledge and wisdom on what to do. Remember, the sunflower likes to follow the light of the sun. So, too, must we follow the light of the Son, Jesus Christ. Really enjoyed that! And seeing a pic of the hubby with the “dirt in his blood”. This is such a good reminder! I don’t want to forget that quote: “Let’s leave it alone until we know what it is.” I certainly don’t want to miss the “joy of the unexpected” things God plants in my life. Thanks for sharing this.